Since it's Labour Day on 1st of May, I decided to trigger my excitability to fill my day with doing something that is more meaningful for holiday. I went to nearby market a get myself a copy of newspaper, looking if there is anything on sales to stock up my grocery at home. Well, no help even got sales because haven't get my salary yet. Then I found this from the classified page. The promotion only start from 24th April to 3 May. 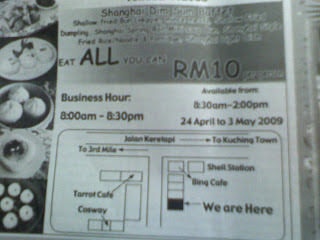 I saw "Eat ALL You Can" at RM10 per person, so I called up few buddies to explore the place. 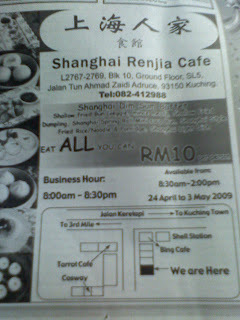 Shanghai Renjia Cafe, it's located to the next building block of The Tarrot Cafe, same building as new opened Bing Cafe at Jalan Keretapi. We walked in and it's partly full, luckily we spotted an unclean table so just sit in, no numbering system, grab your seat while you can. Waiting for the cleaner clean up the table and we start to EAT! The cashier and drinks counter. The kitchen is just behind the glass door. The food line. It's only 10 types of food...a bit dissapointed. One part of wall deco in it. First round...Fried Dumpling, 2 types of fried buns. One of the fried bun in ball. Steamed bun with butter filling (recommended). The filling of fried dumpling. The filling of the bun...more vege. Sweet and sour vege. Too sweet for me. Oh...did I mentioned what drink I ordered? I ordered chinese tea but they served me this. I was worry if they charge me more than RM5 for this pot but it's cost only RM3.50. Haha...that's my so called excitability for the day! Too much flour input...Burp!